Delightful movie. 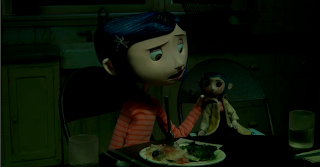 Coraline herself is an interesting character, and the way she explores the house after pointlessly trying to get the attention of her parents is beautiful. The soundtrack also really really enhances the feeling of the movie - which is weird, surreal, and at the same time absolutely enchanting. 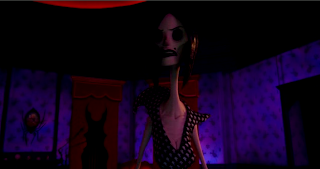 Coraline's parents are prime examples of a weirdly dysfunctional family. Her father seems to mean well, but is too busy with his work, and her mother (also busy with work) is distant and strict bordering on harsh to the girl. Coraline reacts to this by being a "witchy girl". We first meet her when she's running around the countryside and later the woods with a dowsing rod. Back in the house. There's the obligatory family evening meal, and later, it's off to bed for Coraline. The food is disgusting. At night, she wakes up, woken up by mice. She follows one of them down into a room in which she, earlier, found a small door which led into a brick wall. Now, at night, it doesn't lead into a brick wall anymore...but into some weird, surreal world in which she has Other Parents. An Other Mother, an Other Father... and everything she could ever have wanted in her parents. 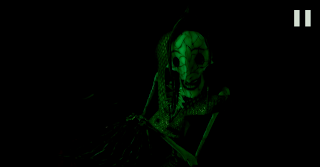 Happy there, she goes to sleep... and wakes up in her own room. And the door is leading into a brick wall... again. 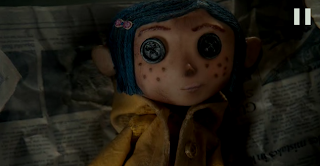 She also gets a package from Wybie (more about Wybie later, let's just say that he's male and a teenager for now), which contains a peculiar doll in the likeness of Coraline. She is a bit pissed off at this. Then she meets the other ...eccentric occupants of the house, among them two old, weird ladies who live with dogs, live in a darkened room, and who read coffee leaves. One of them tells her that she is in terrible danger and needs to be careful. 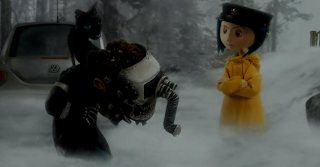 Coraline also manages to meet Wybie again - a socially awkward, but funny little guy with a cat and a bike. He is made of win and awesome. I mean, he wears skeli-gloves. How cool is that? 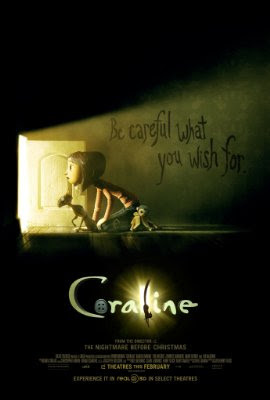 That night, Coraline goes back to the Other World... and things start to get creepy. When she has a fight with her mother the other day, she decides to go to the Other World. The "Other Mother" is already referring to herself and the "Other Father" as Mother and Father. 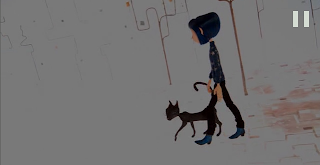 She also meets the cat of Wybie, who can talk in this world... and he explains to her that this world is not a dream come true... but instead something entirely else. 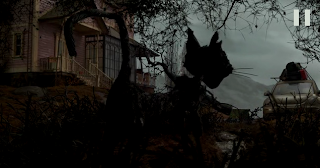 And things get... really creepy. 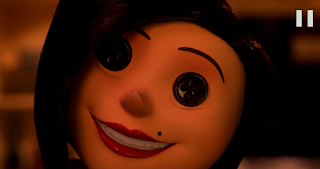 For you see, the inhabitants of the Other World have black buttons instead of eyes... and in order for her to be able to stay, she has to have her eyes removed and buttons sewed into her face instead of them. And everyone is smiling. It's really freaky. For the cat alone this movie wins my full approval. It is full of Neil Gaiman's brilliant, weird ideas (I just got introduced to his books recently). Like his other "children's book" of his, "The Graveyard Book", I personally wouldn't let any child read that unless I really want to form a child in mine own image. I mean, I grew up with myths and Stephen King and Dean Koontz, which isn't the lightest fare, but still doesn't have that psychological depth to it. I really, really don't like children, but another side of me says that if I had read that as a child, I would have turned out even more fucked up than I am now. Then again, I still approve of darker books for children. 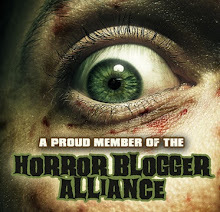 Great movie. The use of soundtrack is flawless and makes this a truly enjoyable piece of animation. The characters are beautifully animated, and the whole movie conveys an eerie mood.